WASHINGTON, DC, December 1, 2011 (ENS) – The Arctic is entering a new state with warmer air and water temperatures, less summer sea ice and snow cover, and changed ocean chemistry, finds the annual Arctic Report Card. Less habitat for polar bears and walruses but increased access to feeding areas for whales characterizes the new Arctic pattern. The 2012 Arctic Report Card was prepared by an international team of scientists from 14 different countries and issued today by the National Oceanic and Atmospheric Administration, NOAA. 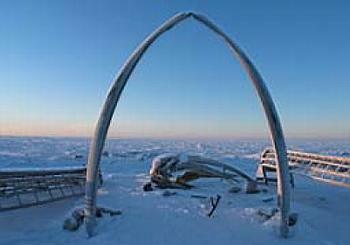 The Report Card tracks the Arctic atmosphere, sea ice, biology, ocean, land, and Greenland. This year, new sections were added, including greenhouse gases, ozone and ultraviolet radiation, ocean acidification, Arctic Ocean primary productivity, and lake ice. In 2011, the near-surface air temperatures over much of the ocean were approximately +1.5 degrees Celsius greater than the 1981-2010 baseline period. Land temperatures also topped their baseline values. This continued a decade-long warming of the Arctic relative to mid-latitudes, the scientists report. “This pattern is responsible for sending cold air from the Arctic southward into eastern North America and northern Europe, and warm air from the sub-Arctic northward into western Greenland and east Asia,” says James Overland of NOAA’s Pacific Marine Environmental Laboratory in Seattle, who coordinated the atmosphere section of the report card. “While the global increase of human sources of greenhouse gases continues, there is no direct evidence that Arctic emissions of methane are changing,” says Overland. The minimum Arctic sea ice area in September 2011 was the second lowest recorded by satellite since 1979. On the Greenland ice sheet and on most glaciers and ice caps elsewhere in the Arctic, the period 2010-2011 was characterized by a negative mass balance. That is, more snow and ice was lost to surface melting and runoff than snow was gained. “The western slope of the Greenland ice sheet in particular experienced a significant increase in surface melting,” Tedesco said. Below-average snow extent during spring 2011 is consistent with a decline observed since the 1970s, and continues an accelerated decrease since 2006, he said. June snow cover extent in Eurasia was the lowest since the start of the satellite record in 1966. Lake ice cover duration, largely influenced by air temperature changes, was shorter by as much as four to five weeks in 2010-2011 compared to the 1997-2010 average for the eastern Canadian Arctic, said Tedesco. River discharge into the Arctic Ocean during 2010 was close to the long-term (1936-2009) mean for the six largest Eurasian Arctic rivers and the four large North American Arctic rivers. Arctic Ocean temperature and salinity may be stabilizing after a period of warming and freshening, according to the report. Acidification of the sea water as a result of carbon dioxide absorption has been documented in the Beaufort and Chukchi seas. Andrey Proshutinsky, of the Woods Hole Oceanographic Institution in Massachusetts, who coordinated the sea ice and ocean section of the report card, points to a clockwise wind-driven circulation regime that has dominated the Arctic Ocean for at least 14 years, in contrast to the typical five to eight year pattern of clockwise-counterclockwise circulation shifts observed from 1948-1996. As a result the sea ice cover has been at least 15-20 percent below the 1979-2000 average. The decline in total sea ice extent has been accompanied by an unprecedented loss of old, thick multiyear ice, Proshutinsky says. 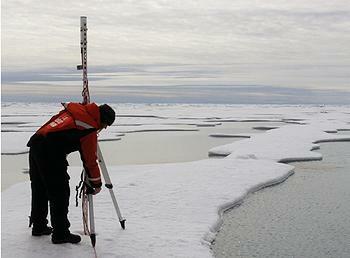 Melting sea ice has released additional fresh water into the upper ocean. The loss of sea ice also has resulted in the warming of the upper ocean and ocean expansion, leading to an increase in the rate of sea level rise. And on land, Arctic tundra vegetation continues to increase and is associated with higher air temperatures over most of the Arctic land mass. 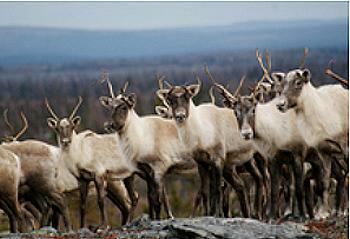 The impacts of this increased tundra biomass production on Arctic wildlife are unclear. Migratory barren-ground caribou appear to be within known ranges of natural variation, with many herds that have experienced declines in the past decade beginning to increase or stabilize. Despite this, rapid environmental and social changes in the Arctic are a concern, say terrestrial section coordinators Skip Walker of the University of Alaska Fairbanks, and Mike Gill of the Canadian Wildlife Service. Gill also chairs the Circumpolar Biodiversity Monitoring Program implemented by the Conservation of Arctic Flora and Fauna Working Group of the Arctic Council. 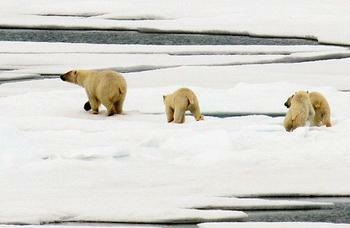 A 2010 assessment of the Arctic’s biodiversity reported a 26 percent decline in species populations in the High Arctic. The first report from the Arctic Species Trend Index showed that populations of lemmings, caribou and red knot experienced declines over the previous 34 years. Walker and Gill write that long-term ground-based observations show widespread greening occurring due to landslides and other erosion features related to warming permafrost, tundra fires and increased human presence in the Arctic.